Last night I continued my wandering across the grid and found my way to the Key West Island sim at the Key West Resort & Marina. 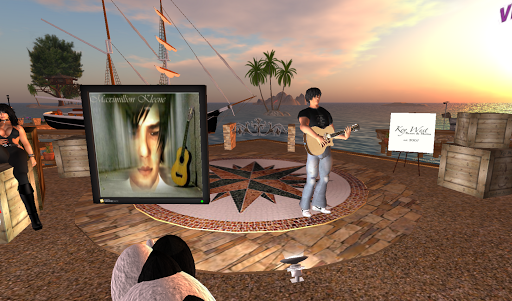 I’m not sure how many live acts are scheduled each night, but I arrived for Maximillion Kleene’s performance. Max plays the acoustic guitar and sings, a gentle folksy sound, a Canadian folksy sound. It was a really nice performance in a lovely environment. And yes, it had a feel of the Florida Keys. 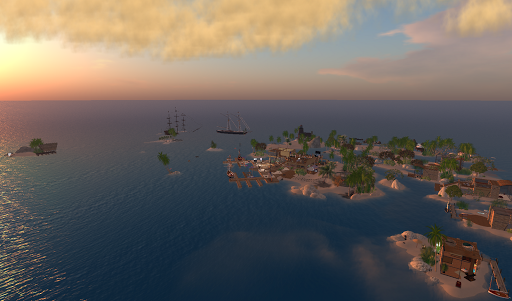 The Key West sim group stretches out across four sims, here is a view of about two of the sims with the Marina in the center. 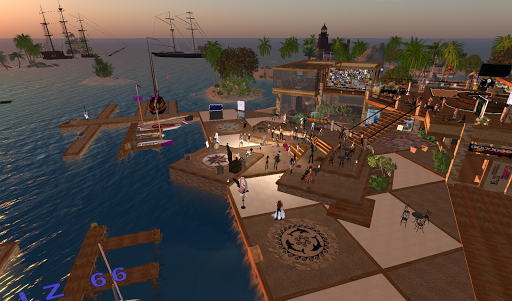 And here’s a shot of the Marina itself, a very comfortable place with a huge open air amphitheater. Btw, in the distant top right is a partially sunken ship, awaiting a scuba exploration. Here’s Maximillion performing to an audience of over forty peeps (I even saw fashion celeb Rebel Hope in the audience). Max has an easy listening style and a warm personality. It’s good music. I have always loved these open air coastal settings, like Junkyard Blues, The Dolphin Cafe, Pier and others. It runs in my blood; well, my human’s blood. I spoke with the co-owner of the sims, Liz Harley, about the sims. She told me it is still a work in progress but from what I’ve seen by camming around, it’s got a really nice Keysie (I know that can’t be a word) feel to it. It even brought back memories of those great days I spent living at New Key West(now gone). 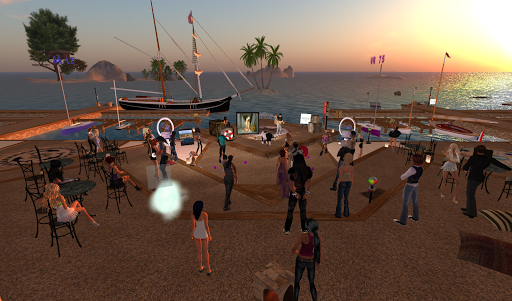 I’ll be back for more live entertainment and to explore this fascinating region of Second Life. This entry was posted in Events and tagged Events, Nightlife, Photography, Second Life, Talented Artists. Bookmark the permalink.